More than 175 architecture and design professionals, customers, dealers, and vendor partners celebrated the grand opening of the KI Design Resource Center in Atlanta on Thursday, September 14. KI manufactures furniture and wall system solutions for college and universities, K-12, health care, government and, corporate markets. The grand opening event featured a club-like atmosphere, complete with “designer” martinis served ice luge-style, hors d’oeuvres inspired by Southern cuisine, and a DJ playing tunes from the local music scene. Firms that joined KI at the event included Gensler, Heery, HOK, TVS, Cooper Carey, The Facility Group, and Gardner Spencer Smith Hench Tensley. Members of the Atlanta Chamber of Commerce and the MISBO Purchasing Consortium, which specifies KI products for its membership of 200 private K-12 schools, also attended. The Atlanta Design Resource Center, designed by Cecil, Pierce and Associates and KI interior designer and color forecaster Sheila LaCount, IIDA, NCIDQ certificant, showcases KI’s solutions for its core markets. Located in Buckhead, the facility includes a 6,500 square foot showroom and a 1,200 square foot training area. Designated areas for college/university, K-12, healthcare, corporate, and government markets feature displays of furniture and applications in “real world” settings. 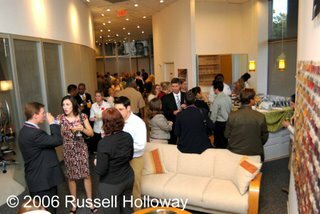 The Design Resource Center in Atlanta serves as KI’s first showroom in the southeast. KI has 13 showrooms around the country.